I must have been singing Renaissance music of one kind or another for more than 60 years and most of the time by instinct – an instinct honed, I suppose, from early years as a boy chorister in an English cathedral, then at King’s College Cambridge under Sir David Willcocks, and thereafter through my 3000 concerts with The King’s Singers. I never claimed to be a specialist in this repertoire but just felt I knew how it should go! It was only when I began to teach Josquin Masses, Tallis motets, Monteverdi madrigals and the like to the excellent young singers in the American Midwest that I really began to focus on the essentials and what should make this music the most expressive of any genre. Listening afresh to current recordings by the top ensembles that do specialise in early music, I became more aware how the flowing polyphonic lines ought sometimes to communicate more immediately to listeners (and indeed singers) who have not necessarily been steeped in the tradition as I have. For me, perfect intonation, gleaming steady tone, and clean lines are not enough and I have become increasingly convinced that it is the responsibility of all singers performing Renaissance music, particularly in a concert situation, to share the beauties of this repertoire in a more open and engaging manner with their curious audiences. I determined that almost all my programmes with my student singers should contain elements of Renaissance music, to trace, preserve and demonstrate the link between the choral music of the past and the present. In much the same way that composers studied the techniques of their predecessors, performers and their audiences should also be gently reminded of these connections whenever possible. As I know from attending multiple choral conferences around the world over the past 15 years, this programme concept is by no means universally adopted. One reason may be a general unease among choral conductors regarding the teaching and conducting of Renaissance music since there are so few obvious clues printed in the music, no dynamics, rubato indications or other such marks of expression. The proliferation of recordings of early vocal music sung with great expertise, though not necessarily a lot of expression, may intimidate conductors and persuade them to devote more time to the dense harmonic language of certain schools of contemporary choral music, for instance, than to the long, elegant and expressive lines of Renaissance polyphony. Asked by the IFCM to write something about the genre, I offer two principle guidelines in the hope that they will encourage more conductors to expose their singers and audiences to the inherent beauty and infinitely moving gestures of Renaissance polyphony. By chance, I am writing this brief article between rehearsals with a fine choir of professional singers who, though well-trained vocally, have had little exposure to the relatively simple techniques outlined below, with the result that the polyphonic lines of the Renaissance Mass we are preparing tend to emerge rather stiff and unrelenting until a considerable amount of ‘teaching’ has ensued. What gives Renaissance music its unique power to communicate? The skill of the composer in expressing in a melodic line the fundamental rhetoric of the text. What is meant by the term rhetoric? The attempt by one human being to influence another with words. ‘Et in terra, pax’, ‘Now is the month of Maying’, or ‘Ecco mormorar l’onde’. 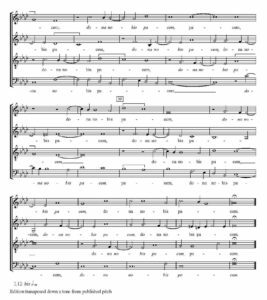 Sing an individual line from any piece of the period, sacred or secular, by any half decent composer, giving a little weight to the stressed syllables and lightness to the unstressed and the line will immediately become more melodic, more touching, wittier and more communicative. It is important to remember that this rhetorical rise and fall would have come naturally to Renaissance singers, as the art of rhetoric was an essential element in general education. Everyone studied rhetoric; everyone was expected to express himself or herself in a persuasive manner. We have to indicate the text stresses more deliberately, as this approach to sung text is no longer the norm. This means only that we have to be as careful not to overemphasise as to underemphasise. We need to look for the fine balance between mannered singing on the one hand and bland expressionless lines on the other hand. The stresses need to be accentuated just enough to allow the discerning listener to catch them at first hearing. Anything less results in the wall-to-wall polyphony which is so common: beautiful but bland and uncommunicative. Composers of the period wrote lines of music (with very few exceptions) which enhanced the meaning, the rise and fall, and the contours of the text. In spite of having sung this music all my life I now find myself underlining the word stress in every line of polyphony I conduct as my first step in score preparation. At a first rehearsal with any ensemble in my charge, I read the text through carefully with an attempt at rhetorical emphasis and ask that all the singers underline the stressed syllables in their own part – and on occasions in all the other parts as well! Gentle adherence to the text stresses is my first ‘essential’ and in my experience singers have to be cajoled, teased, pushed (or whatever other technique is appropriate) to follow this dictum. It is not a technique which comes naturally any longer; voice students in particular need a lot of persuasion to lean gently on some syllables while (even more importantly) letting others go! I consider that identifying of all the suspensions in a score is the essential duty of every singer of Renaissance music. I mark each one with a line (red in my case!) and insist that the singers do likewise. Of course in Renaissance times, and with the use of part books, these signposts would have been noted aurally by the singers and followed instinctively. We have the scores in front of us but too often let the suspensions slide by with scarcely a second thought, thereby bypassing the glorious sense of tension and relaxation created by these timeless devices. What you do with the suspension is a question of personal taste, as an over emphasis can lead to an irritating see-saw; but a subtle leaning towards and a slight easing away should heighten the expressiveness of each line, touch the emotions of the singers and tingle the hair on the back of the necks of the audience. 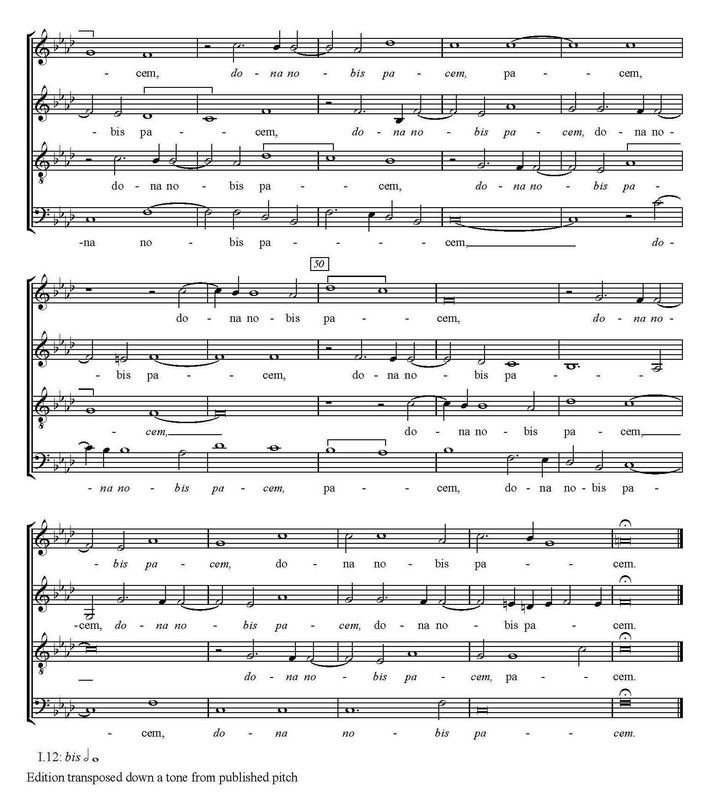 One of the most potent examples of the power of the suspension can be found in the latter half of the Agnus Dei from William Byrd’s Mass for Four Voices on the words ‘dona nobis pacem’. Do not be afraid of subtle rubato and tempo flexibility for expressive purposes if the music or text, or both suggests. Commas in the text, before or during homophonic passages in the midst of a polyphonic Mass setting, cry out for flexibility to point out the rhetoric to the listeners. Recognise and develop the identity of individual motifs. Emphasise the differences between long and short phrases. Identify the most significant melodic lines in polyphony and expose them. Allow the rise and fall of the intensity in the writing to indicate dynamic levels. Study both the individual arches and the grand architecture. Build towards accumulation points – where the polyphonic strands converge at cadences, for instance. Lean towards the suspended dominants at cadence points and settle gently on last chords, which are so often on unstressed syllables – particularly, of course, in Latin. Encourage singers to share with their listeners the beauty and the special features of their individual lines by using their eyes, their facial expressions and slight body movements in the manner of a fine orator and master of rhetoric. I hope it will be clear that these observations (particularly the last) are personal. I am aware that experts in the genre may find them overstated. However I remain convinced, after many years of conducting rehearsals and performances of Renaissance music in concert, that singers and listeners can, to a much greater extent than is common, share the power of Renaissance music to stimulate the emotions and to change lives. Just yesterday a 21 year-old singer said to me after our concert how this approach to the singing of Renaissance music had reminded him why he had decided to pursue a career as a musician. Encouraging words indeed.